Do you agree with me that leverage is the killer? i don’t allow with you. leverage is a great benefit. we can buy or sell more volume when we has some great signal. we can get it a month or a few months. we need ready to it. Well i met a lot of new traders who blasted their accounts in 2-3 Months time. Often i notice these new traders trade big lots relative to their account size and that’s often the reason of failure. So I call it leverage the killer. No, I don’t agree that leverage is the killer, nor do I agree that using bigger lot size is the reason for failure. The killer or the reason for failure is not having a trading business plan that would account for your risk tolerance. Alternatively, the killer or the reason for failure is NOT following your business plan. It has happened to almost every one that at some point arrogance or greed or carelessness takes over your good judgement. This is the point where you are likely to fail more often than score a home run. In simplest of terms, follow your trade plan for entry rules and determining lot size and corresponding StopLoss to manage your risk. Once you are in the trade, you move on to trade management for exit and managing your winners in accordance with your trade plan rules. There is as simple as it is - make a business plan and follow it strictly - and let’s keep it that way for achieving success in this business and not make it so complicated that it will lead you to failure. Yes it is of great use as you can get huge profits, but its useful only when you place good trades otherwise leverage can be disastrous. Many people say you need to look at your “risk”, but the word risk in forex changes depending on who you ask. The reality is with any OPEN order in the market, then your RISK is the same as anyone else. How so? Well because by simply being exposed to the market, and the ability of your broker to cause slippage or lag, your spread can be widen to skip past your sl, or activate pending orders which were hundreds of pips away in a matter of ticks only to margin call your account no matter what your leverage is. As to chime in on the question asked by the O.P. “LEVERAGE” isn’t the killer of an account. Leverage + HORRIBLE PIP-DRAWDOWN" is what causes your account to suffer massive losses. In other words, if a person aimed to get the best entry possible, instead of worrying about the profit, then your “pip-drawdown” would essentially be low. You’ll see many people who taut about 95% rate, and even though their account is in green they end up giving to the market - 50 pips for every 1 they earned. Yes… A person may of earned 10 pips (which of course is a winning trade), but before closing for profit they were in red as much as 500 pips. That gives them a REAL R:R of 50:1 which is HORRIBLE. The problem I have with “social trading” is almost no one focuses on accuracy. Mainly in part because they trade the higher tf which doesn’t allow for pin point accuracy. So for all the new traders out there, if a person offers to manange your funds, always ask for third party verification like myfxbook, or trade explorer and make sure the person has their trade history public. This will allow you to check for accuracy. it is important in my strategy. we have higher purchase with this benefit. but we need plan about risky to control it. we will have some great signal . we can make big money with it. we can join in the market witn leverage and bonus. it will have us bigger in market. we can get more profit with lower fund. I do not agree with you that leverage is the killer. The trader itself is the killer. Leverage is a double edged sword, no doubt about that. However, it’s not leverage to blame for a trader blowing his account. It’s their inexperience and gambling mindset combined with a ****ty trading strategy that does that. Many smart traders (smart meaning experienced traders who understand market mechanics and trade with a proven edge) use leverage to maximize their gains, you’d be surprised at what they can achieve. However, most people don’t know how to use leverage properly and trade with a crappy system, so in that sense yes, leverage is the killer. I should add that most newbies should trade with low leverage IE 1-2% risk per trade. This will help keep you in the game long enough to learn how it works and find a suitable and profitable strategy. After you gain that experience and develop your strategy, increase your leverage to a comfortable amount depending on your expectancy and win ratio. But many noobs probably won’t listen to me and blow their accounts anyways so whatever. We all remember how we thought we were hot shots and smarter than the guys who’ve been at it for years until the market handed our asses to us. Leverage is certainly the killer for all those who can not manage it to their advantage. Most of the traders get tempted to trade with bigger lot size when they have high leverage even after knowing the fact that their account is too small to hold the drawdown. Exactly, the fact is most people who start out think, ow I can make loads from high leverage and not think about if the pips go the other way and then that account is bye-bye, but if you can manage your account then leverage is a great thing. [B]" A grasp of Money and Self Management techniques is crucial to longevity. Without longevity you’ll be out of the game BEFORE you’ve had time enough to learn how to make profits trading." - TWDL- Joe D.
The interesting part of the 4 things listed above isn’t the leverage. As the gun can not be used to fire unless someone or something is present in order to pull the trigger. The killer of all accounts is a combination of the Trigger + Vest + bullet (with that order being the most important). A combination of the three is what we know as being the “money/trade management”. Most of us have heard about “not risking more then 1%” of your account, but the reality is the first trade which you place sets off the bias which you will have for the life of the account. If you buy say EU and the trade goes against you, then the reality is every time the price drops, you will be looking to buy more, thus ignoring Price action which determines where the currency will go now, and in the future. You may actually risk 1% of your account, but adding more trades, or not simply aiming for accuracy is what blows the accounts because by nature, humans have been designed to ignore price action, as we believe we can predict what a currency will do. If a person on avg doesn’t give the market more then 20 pips before closing profits for a trade, no matter how many pips he or she takes in profit, then your money management or better yet, the type of bullet (leverage) should be determined based on that. I personally have seen on another forum, a guy who has a 100% win rate, but the amount of pips he has of floating loss exceeds over 400 pips. At times, even thought, a 400 pip floating loss may not be more then 15% drawdown the reality is 400 pips is way to many pips to be giving to the market no matter what tf you are trading. So to the new traders, and please take this from a person who lives from trading, focus on being as accurate as possible. Do not take a trade based on news, nor on opinions of anyone because when those trades fail you will be the one left holding the bag. 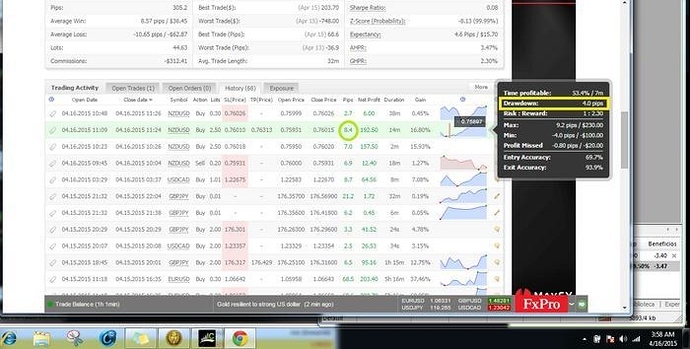 If you can find accurate entries (entries in which you give less then 20 pips to the market before you close for profit) then the reality is you can wager 1% of your account per pip easily as long as you stick to your hard stop loss. To sum it up, leverage isn’t the killer of the account, but the actual system and the comfort people have when they say the market is cyclical, so the trade will come back to me at some point. Agreed. Leverage can be a good thing when risk is managed. Even with low leverage you can blow your account if you risk a large percentage of your account per trade. This happens when high leverage is used and the trade taken is with huge lot size that the capital can not hold for long time because of which traders lose their hard earned money to the forex market very quickly. Nothing would kill an account faster than high leverage. High leverage will have been driven by greed!! High Leverage is never the killer and will never be. It is just the gun, the killer is the trader himself,when he is acting without thinking. Leverage by itself can’t kill your account. With proper risk management, the height of leverage is irrelevant. When you set a proper risk, let’s say 2% of your balance, and you calculate your position size according to your entry, stoploss and risk, it doesn’t matter if you leverage your account with 1:100, 1:500 or 1:1000. You will always just be risking your 2% (under normal circumstances). Leverage will only become dangerous, when the trader won’t do proper lotsize calculation and just uses a “random size” which he thinks is ok. But then, the trader kills himself with the leverage, he won’t by killed by the leverage itself. Hmmm, I think that it’s depend on how do they manage it. Leverage can be the killer, LOT/Volume can also be the killer. For using leverage, if you have small balance, you must use high leverage 1:1000. it will be safe for your account. Why would leverage be a killer in trading? Without leverage, you can’t even trade. To note the utmost fact that, most traders loses money because they over-leveraged. If you had a leverage of 1:500/1:1000 and you still utilizes the risk management of 1 to 2% per equity, it’s totally fine. Unless you are risking more than the standard 5% with 1:500 leverage, you’ll definitely bust your account in a short period of time.